The UN human rights agenda has reached the mature age of 70 years and many UN mechanisms created to implement this agenda are themselves in their middle-age, yet human rights violations are still a daily occurrence around the globe. The scorecard of the UN human rights mechanisms appears impressive in terms of the promotion, spreading of education and engaging States in a dialogue to promote human rights, but when it comes to holding governments to account for violations of these rights, the picture is much more dismal. This book examines the effectiveness of UN mechanisms and suggests measures to reform them in order to create a system that is robust and fit to serve the 21st century. 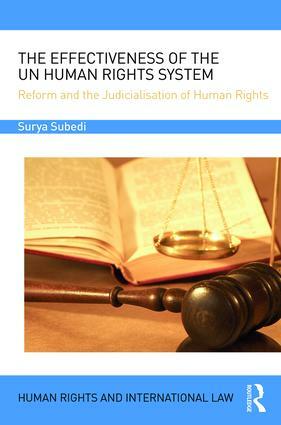 This book casts a critical eye on the rationale and effectiveness of each of the major UN human rights mechanisms, including the Human Rights Council, the human rights treaty bodies, the UN High Commissioner for Human Rights, the UN Special Rapporteurs and other Charter-based bodies. Surya P. Subedi argues most of the UN human rights mechanisms have remained toothless entities and proposes measures to reform and strengthen it by depoliticising the workings of UN human rights mechanisms and judicialising human rights at the international level. Surya P. Subedi offers a scholar's diagnosis of what is wrong with the international human rights system and a practitioner's suggestions to fix it. Drawing on his experiences as an activist, an academic, and as a UN Special Rapporteur, he shows the possibilities and the limitations of this vital body of norms — and how they might translate from words to deeds. Surya P. Subedi, OBE, QC (Hon), is Professor of International Law at the University of Leeds, member of the Institut de Droit International, former UN Special Rapporteur for human rights in Cambodia and barrister at the Three Stone Chambers, Lincoln’s Inn, London.